Had serious PC problems this morning when malware locked me down. Katie helped get me back online just a few minutes ago. So, limited input today. As of noon today (above - only ALERT sites with measured rain were in the Catalinas and Rincons) the "event" has pretty much been a no show, except for light precipitation in the high elevation zones. Low elevation forecasts pretty much a bust. The model trends yesterday were, unfortunately, right on, as the AR that brought big rains to San Diego area weakened and just brought clouds to our part of Arizona. The 12 UTC WRF forecasts form Atmo continued the down trend with forecasts of no rain at all for much of the local area. There are isolated showers around now, so still a chance for a few low-elevation spots to get a bit of rain. However, this has been mostly another lost opportunity. As tonight/tomorrows' weather event draws quite close, the forecast models have now turned toward drier forecasts. The GEFS ensembles for airport QPF (below) now range from 0.12" to .44" with mean of 0.25". The SREF ensemble forecasts are similar, but a bit drier, with range from 0.00" to 0.47" and mean of 0.17". 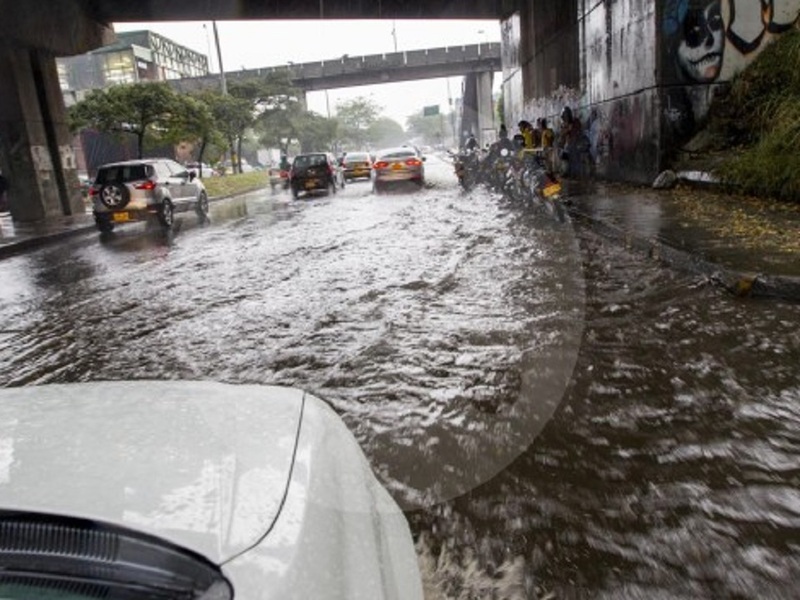 The current trend continues to be driven by the various models' forecasts of available moisture. Shown here are the 06 UTC WRF-GFS forecasts of PW valid at 05:00 am MST (above) and at noon (below) for tomorrow on the 5.4 km grid. The AR from west-southwest of San Diego now is forecast to weaken very rapidly and apparently leads to the drier trend. The high resolution WRF forecasts valid at midnight tomorrow night both are forecasting little at the the airport (GFS version above and NAM version below). However, the WRF-GFS sounding forecast for Tucson (second below and valid at 10:00 am tomorrow morning) appears favorable for showers and perhaps even thunder, so the WRF variants may have gone a bit too dry. These models continue to forecast some gusty winds with this system, particularly tomorrow in Cochise County. All we can do now is watch how things evolve. I see four of these objects in the field. Two in the sky (the one you see and one in the upper right) and two on the mountain (all are circled in the attached image). 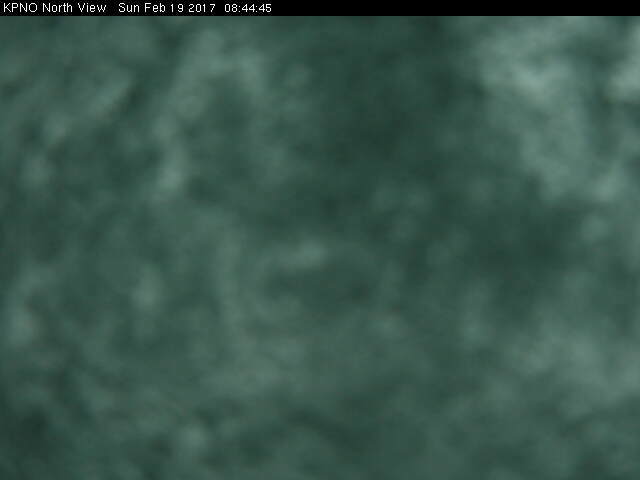 I think all four are hot (or bad) pixels that become more and more common as webcams age. It is possible they are only visible when it is dark and the signal is low. It’ll be interesting to see if they reappear tonight. The other object that struck me as out-of-the-ordinary is the small white dot on the horizon (circled to the right of the Mayall. It could be a cloud or mountain top catching the morning Sun. 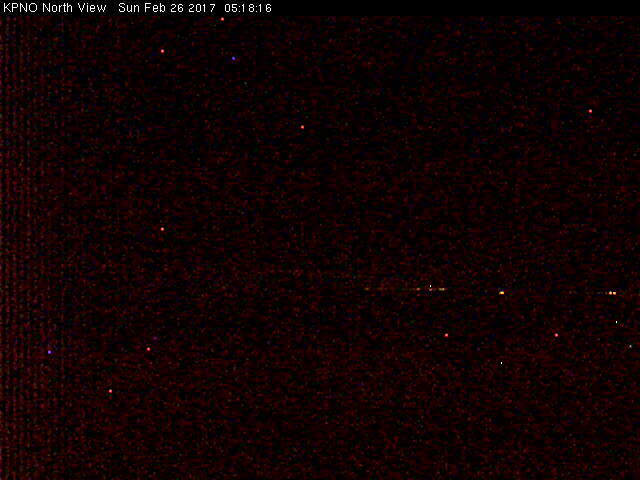 I looked at a few night shots from the webcam and the field is full of red and blue bad pixels. Four of them correspond with the ones we saw yesterday. My guess is that as the camera autosets increases its gain setting for low light conditions, these bad pixels become visible. I wish bad pixels weren’t a problem with all low light detectors (from a $50 webcam to a $15M spacecraft CCD), but they are a part of our reality. Heavy, middle-level cloud cover moved in during the night, keeping temperatures mild. The low here was 47 F vs 27 F yesterday and airport low was 49 F vs 36 F yesterday. 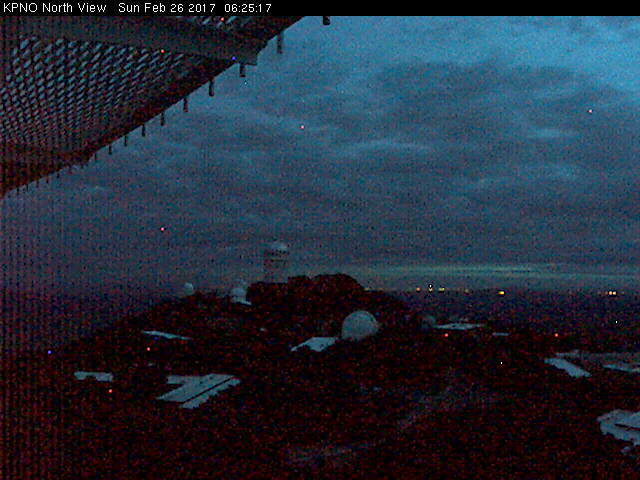 Image above is north view from Kitt Peak at a bit before 07:00 am MST. The morning sounding plot from TWC shows a very layered atmosphere with saturated, or nearly saturated , conditions above 625 mb, but very dry conditions below. Morning 500 mb analysis (below from NCAR) features a weak short-wave blip over LA Basin that will zip by today with little impact, other than clouds and perhaps some virga. This will be followed late tomorrow by a more substantial wave that will bring some precipitation for the end of month. Composite radar forecast from the 06 UTC WRF-GFS above is valid at 06:00 pm tomorrow afternoon, while the model's forecast of total precipitation through 05:00 pm on the 28th is shown below. The precipitation is forecast to occur as an AR impacts southern Arizona - at bottom is model's forecast of PW valid at 06:00 pm tomorrow evening. The 06 UTC GEFS members continue to forecast a considerable range of possible precipitation amounts at the airport - 0.15 to 1.21 ". Since yesterday morning, the global models have trended wetter for the end of the month. Graphics here show GEFS QPF plumes for TUS from 00 UTC last evening (above) and from 06 UTC last night (below). By 06 UTC last night the ensemble members forecast a precipitation event Monday late into Tuesday the 28th. The POPs for TUS are essentially 100%, with only one member not forecasting at least 0.01" for the airport. However, the spread for QPF is very large - ranging from 0.00 to 1.50 inches. So much uncertainty remains. The big driver for the wetter forecast seems to be the intrusion of a pronounced atmospheric river (AR) into southern Arizona. The 00 UTC WRF-GFS forecast of precipitable water (second below on the 5.4 km grid) valid at 05:00 am MST on the 28th shows this distinct feature. Here are two WRF-GFS forecasts for total precipitation though 11:00 am on the 28th The top is from the 00 UTC run on the 5.4 km grid (compare with the week-long forecast shown in previous post to get a feel for how quickly the model forecasts have changed). Below is the 06 UTC forecast on the 1.8 km grid. It is important to note that the 06 UTC GFS operation run forecasts half an inch at airport but the high-res WRF version reduces this to a tenth of an inch. End of month becoming more interesting, especially if the wetter trend continues between now and then. Interesting sign along my walk route this morning. Red-tail Hawk in flight last week. Rillito wash has been flowing most of past six weeks or so - this was yesterday morning. 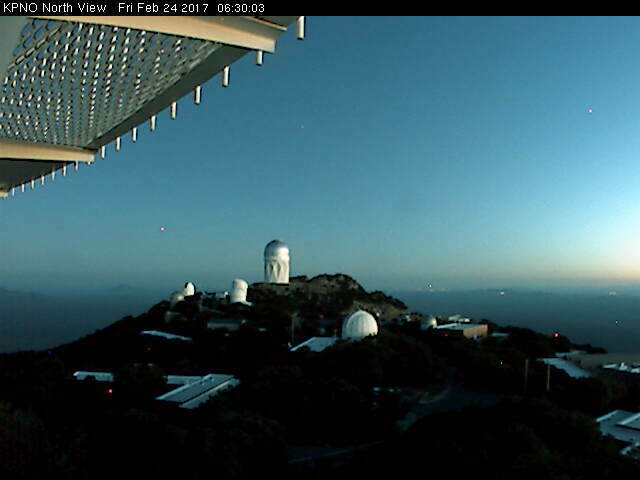 Not sure what the north-looking camera at Kitt Peak was capturing just before sunrise this morning - image above is from 06:30:03 am MST. There was no noticeable movement over the next few minutes, and the object faded away as the sun came up. Cold morning in southeast Arizona, with lows in the 20s F common - coldest morning of month here at house with low of 27 F. The coldest lows I found on MesoWest for non-mountain elevations were 19 F a bit west of Tombstone and 18 F a bit east of Sonoita. Finally, the forecast below is from the 00Z WRF-GFS forecast last evening and shows total precipitation (on the 1.8 km grid) forecast through 05:00 pm on March 3rd. The operational GFS certainly not forecasting any lion-like weather here in southern Arizona as we move into March. 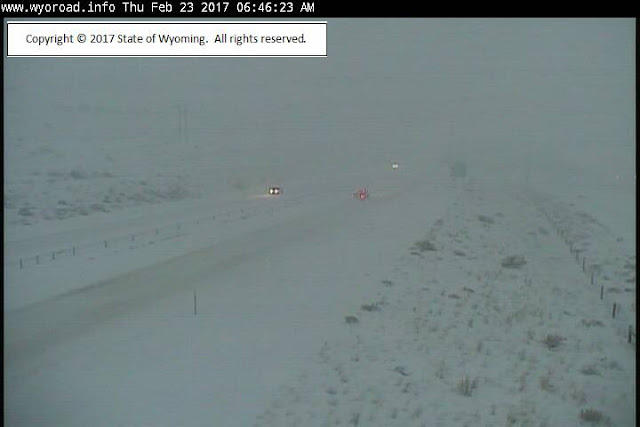 A developing winter storm is impacting Wyoming and Colorado today and will spread blizzard-like conditions eastward across Nebraska and Iowa. Webcam view (above) this morning shows I-80 at Rock Springs, Wyoming, while that down at bottom shows Pagosa Springs, Colorado. For Tucson, the airport GEFS plumes from 00 UTC last evening can be categorized as chaotic for the end of February and start of March - some possibilities of precipitation, but with wide spread in both timing and amounts. Forecast below is for total precipitation from 00 UTC WRF-GFS on the 5.4 km grid through 05:00 pm MST on March 2nd. The model forecasts most activity for the mountains to our north and far north and little over lower elevations from Texas and Mexico westward to southern California. Very nice day today with high of 80 F with fairly respectable dewpoint in low 40s. So, I'm thinking ahead to summer. Photo above is of a wet microburst yesterday that occurred in Medellin, Colombia. 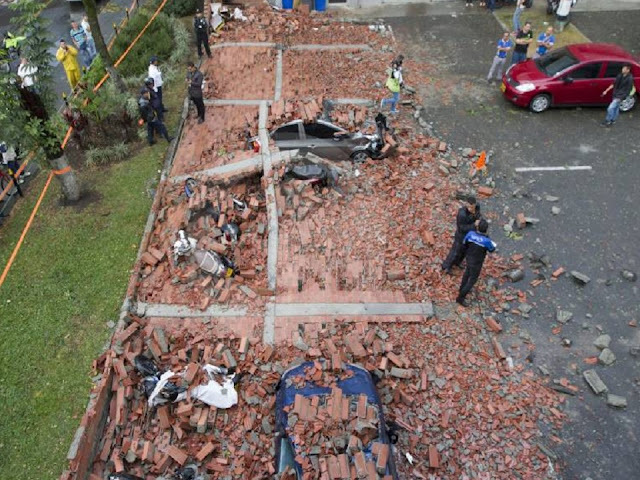 Other photos of heavy runoff and wind damage from the microburst. 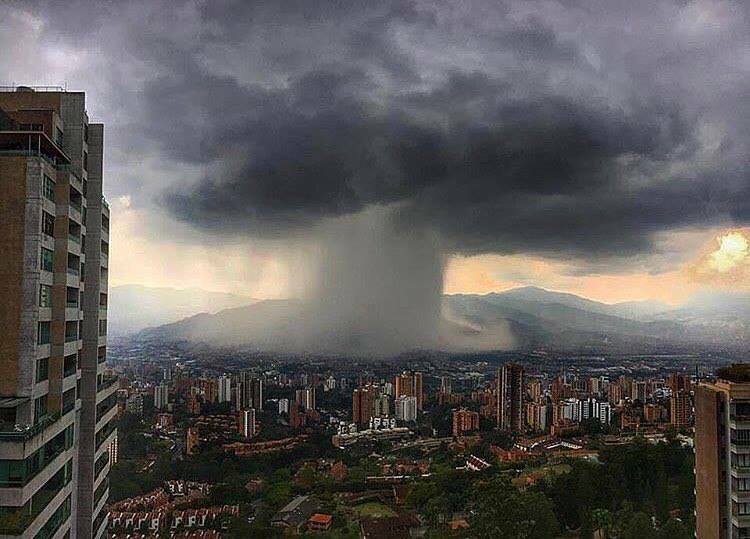 Map at bottom shows location of Medellin. Occasional light showers occurred over eastern Pima County Sunday (yesterday) and on into the night. Amounts from the northern 2/3 of the ALERT network are shown above for 24-hours ending at 06:00 am MST this Monday morning. Amounts were again generally around a tenth of an inch. 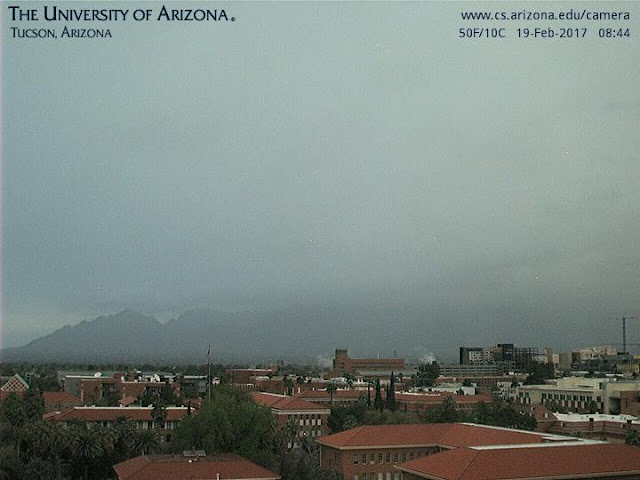 Here at house we managed to get 0.19" as showers formed over the Tucson Mountains and moved our way a number of times (total here for the two days ended up at 0.24"). During coming week, short waves will tend to stay to our north and a brief warm up will be followed by cooler temps and some periods of west winds. Next possible precipitation at least a week away, according to GEFS forecasts. 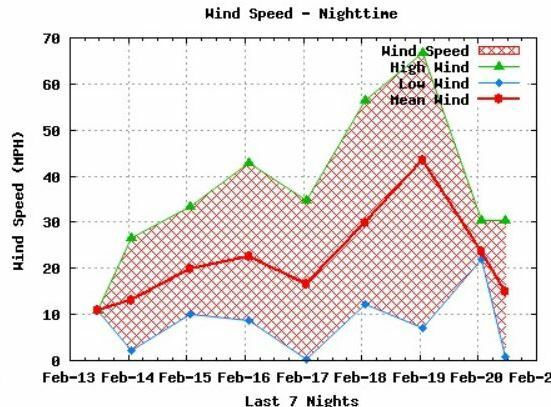 I noticed that wind gusts were very strong out west at Kitt Peak on Saturday and Sunday, with 12-h maximum gusts ranging from 56 to 93 mph - as shown on the two time-series plots below. 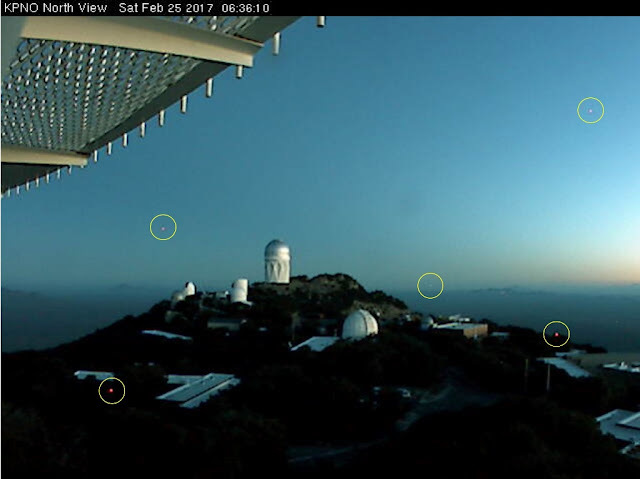 These are from the weather station on/at the Mayall 4-meter telescope, which is number 12 in photo above. I don't know where this weather station is actually sited, which is of course information needed to assess exactly what these measurements might mean. 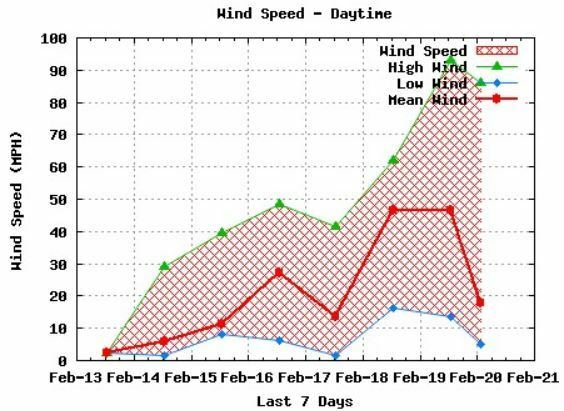 I would guess that obstacle flow due to the telescope structure is amplifying the wind speeds. Any information from those in the know would be much appreciated. 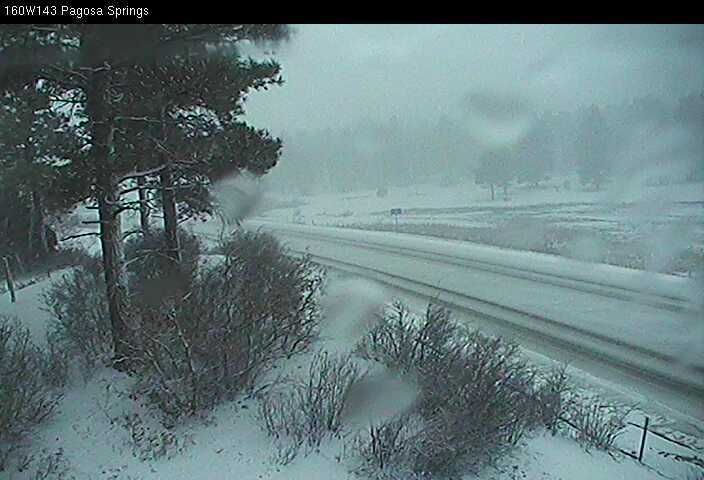 Here are some web cam images from this morning. Top two from local sources and bottom two from Jack Hales site. Dreary morning here - above. 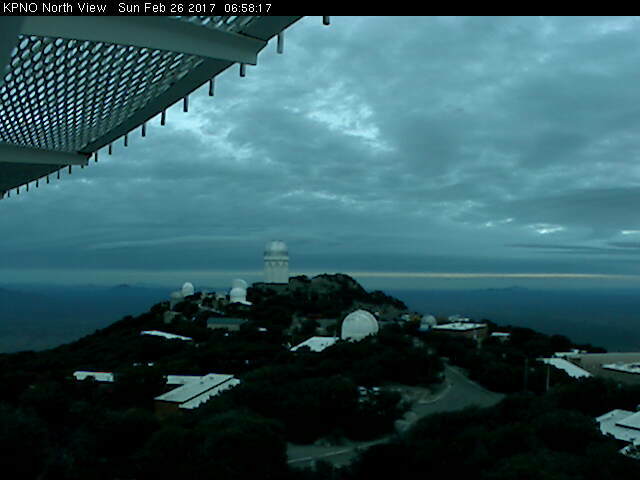 Kitt Peak North view all iced up - below. 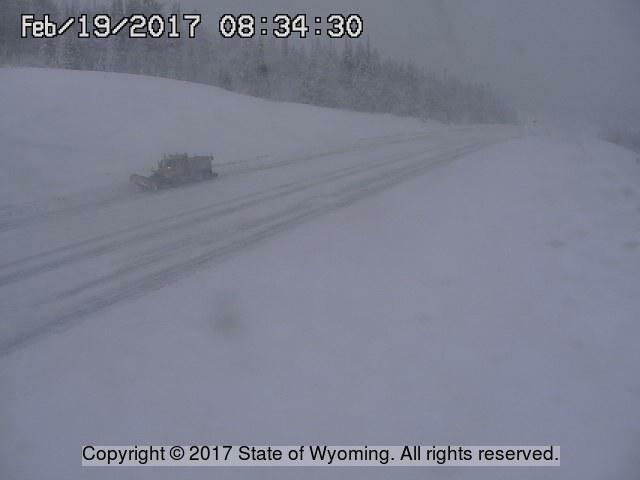 Lonely snowplow at work in Wyoming - above. 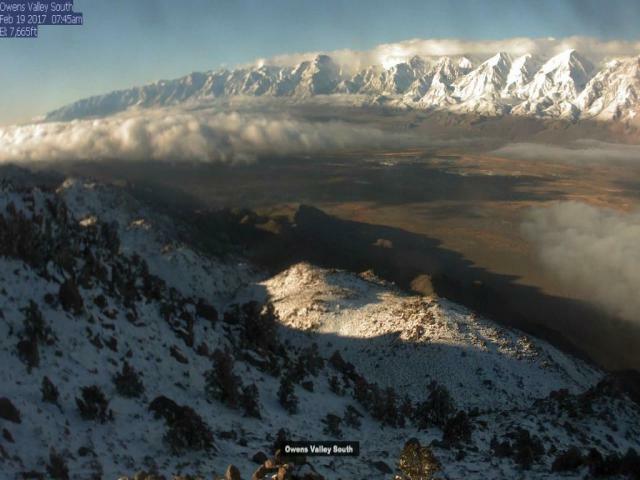 Owens Valley, California, with the mountains covered in heavy snows - below.